Harry Styles has proven to be quite the fashionista while on break from the 2013 Take Me Home Tour. He’s been spending quite a bit of time sitting at the front row of various SS14 shows at this year’s London Fashion Week.He’s been spotted at the Burberry show as well as the Topshop catwalk. Rumours began flying when Harry seemed to show an interest in model Cara Delevingne when he was sending her “knowing flirty looks across the catwalk” at the Burberry show yesterday. Is Harry off the market? In an interview with MTV he was asked if he was looking forward to “seeing his girl” Cara. He was then asked why people are obsessed with Cara’s unique look. “It’s probably them eyebrows, yeah, probably them,” he replied. 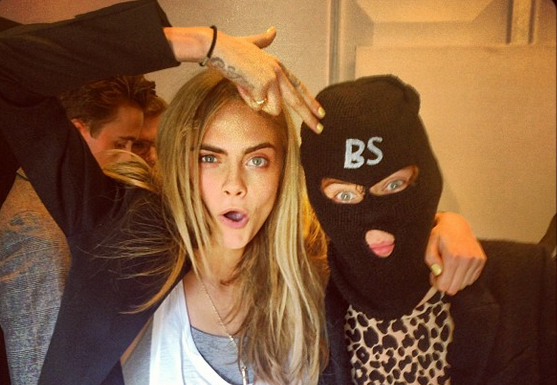 You never know, the 19 year old’s heart may have been stolen by top model Cara Delevingne’s eyebrows.